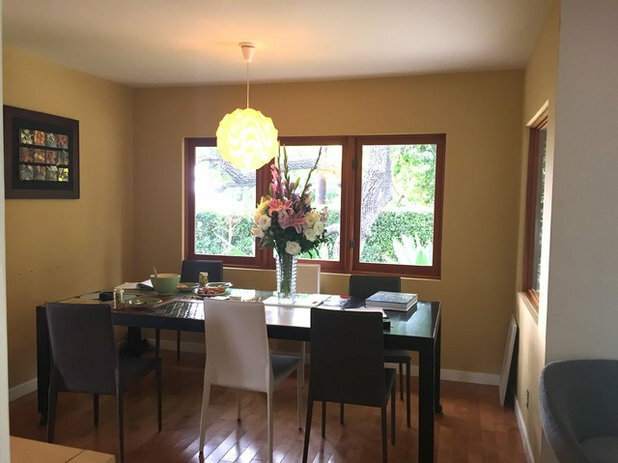 Before: This kitchen in a midcentury home in Los Angeles had a poor flow that the homeowners had been living with for over a decade since purchasing their home. The island was oriented oddly, leaving a narrow passageway between it and the oven wall. 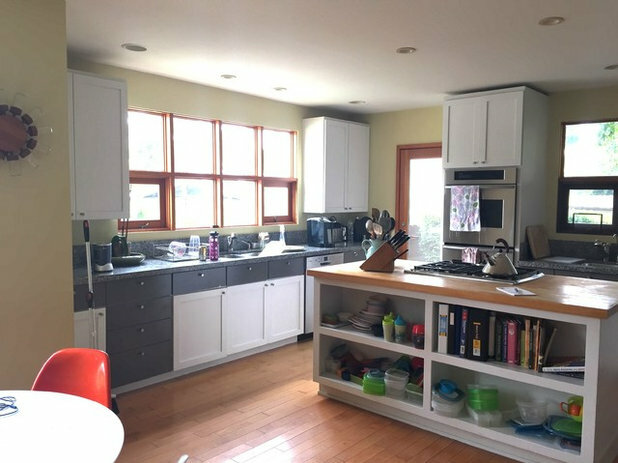 Open shelving on the back of the island contributed to a cluttered feel, with food storage containers and binders visible. 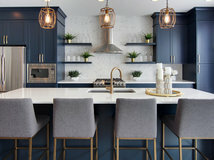 Stylistically, the kitchen was all over the map, thanks to a mix of Shaker and flat-front cabinet doors in a somewhat random blend of black and white. 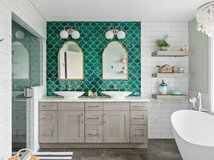 Designer Camille Henderson Davis of The Niche Home helped the homeowners get more function while bringing a midcentury flavor to the space. 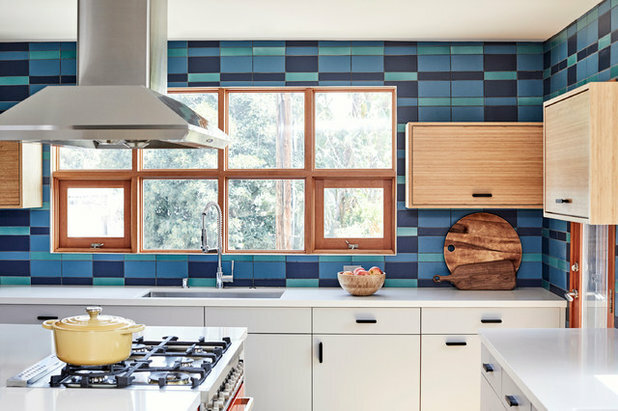 After: The kitchen’s new backsplash features subway tile in multiple colors laid out in a pattern that channels the look of plaid. 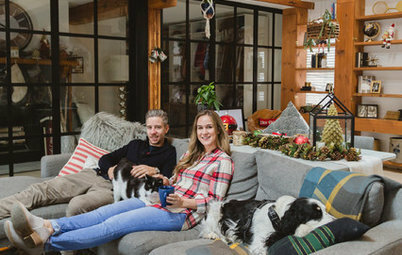 “My client had quite a few ideabooks,” says Davis, who encourages clients to use visual tools like Houzz ideabooks to share their design thoughts with her. 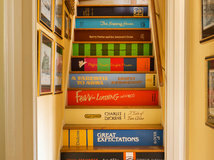 “I spent a lot of time looking at inspiration images that the client had pulled from Houzz,” Davis says. 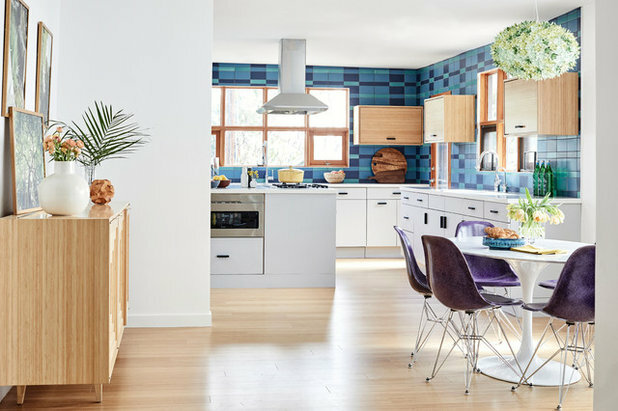 “The colors had continuously been aqua blue, lavender, orange, white and gray.” Davis blended the client’s beloved blues in the backsplash, and found ways to incorporate the other colors (except purple, which makes an appearance in the dining area) in the room’s palette. 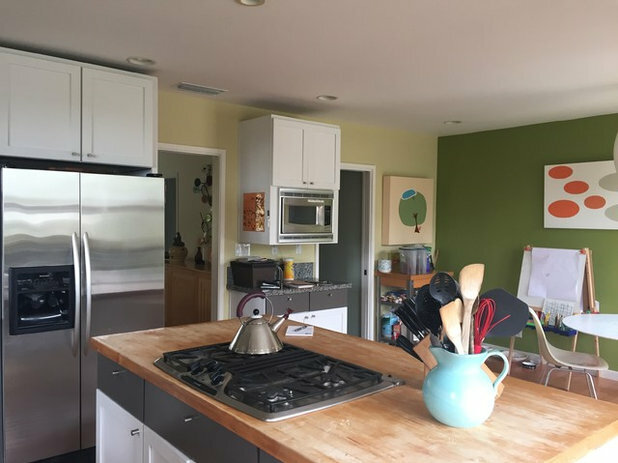 Flat-panel lower cabinets in light gray (color-matched to December Sky by Dunn-Edwards Paints) keep the kitchen feeling bright, while bamboo upper cabinets add warmth. 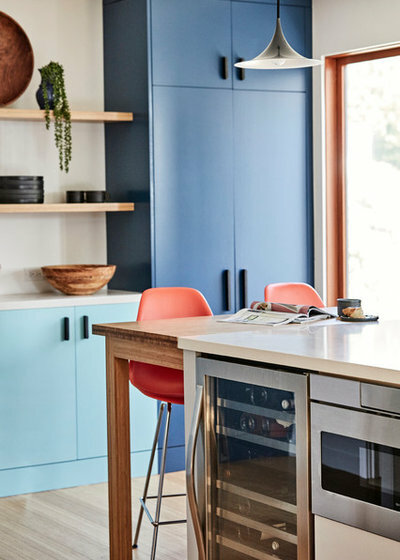 The hardworking melamine finish of the lowers guards against scratching, a good choice given that the couple’s 6-year-old son is fond of climbing onto the cabinets. The project’s contractor, Santa Fe Construction, custom made all the cabinets. The new kitchen island’s long side runs parallel to the room’s back wall. This orientation better fits the shape of the room and allows for a smooth walkway around the island; the pathway between the island and the sink wall is now 2 feet wider than it was before the renovation. The new kitchen has four zones: cleanup, meal prep, cooking and dry food storage. The sink on the right in the floor plan seen here marks the prep zone, where the homeowners can wash food items and then chop and prep food on either side of the sink or at the island. 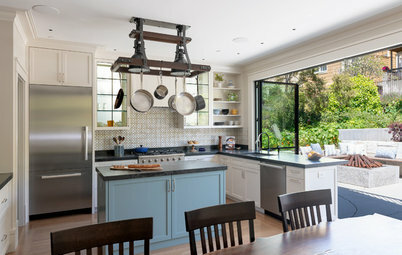 The refrigerator is across from the island’s beverage refrigerator, forming part of the working area with the range top and oven that form the cooking zone. The back wall is the cleanup area. 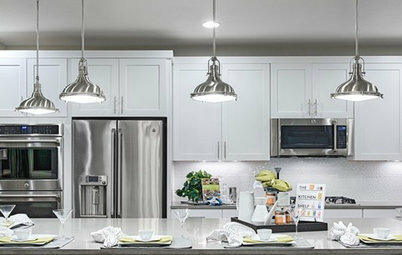 To the right of a large sink is a dishwasher hidden behind a cabinet front, and a trash and recycling pullout. The family stores everyday dishes in the upper cabinet to the right of the window, and glassware in the cabinet to the left. 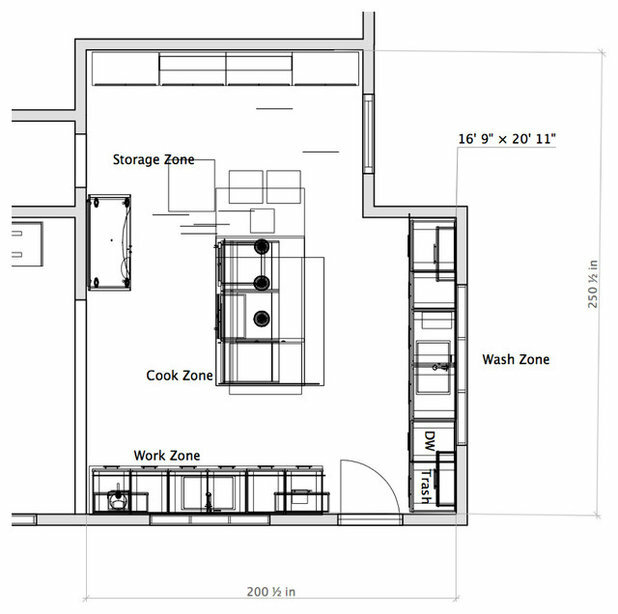 The far wall at the top of the floor plan is the storage zone (more on this later). Before: The refrigerator wall (shown on the right here) once separated the kitchen from the dining room. The dining room was behind the refrigerator wall. 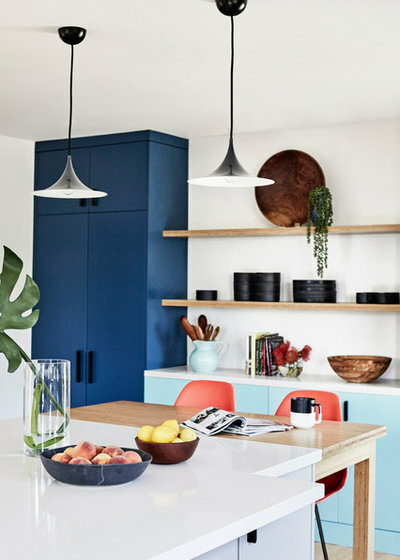 In the dining room, Davis added a Knoll light fixture, a Saarinen Tulip-style table and chairs that reference the midcentury period that the homeowners like. Their home was built in the 1950s. 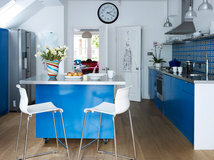 Before: The old kitchen contained space for a dining table opposite the island. 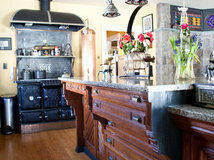 After: Since a kitchen table was no longer needed, Davis created more storage where the kitchen table previously stood. She added two floor-to-ceiling cabinets on either end of the wall, with a buffet and open shelving between them. The refrigerator (shown on the left in this photo) is now on the wall where the microwave was. Here’s a look at the cabinet on the right side of the room, peeking over the end of the island. 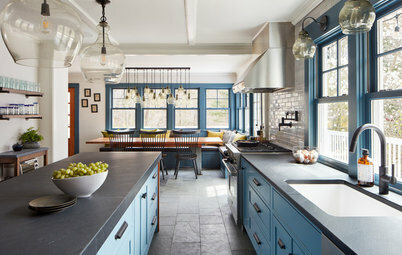 The darker cabinets are painted in Blue Earth and the lighter ones in Aqua Bloom (both from Dunn-Edwards Paints). The family entertains often, and the aqua buffet gives them a place to set up trays and food when hosting. 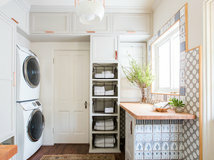 They use the tall cabinet to the left of the buffet to house cleaning supplies, while the buffet and tall cabinet to the right house dry food goods. Adding cabinets to this portion of the room made up for the storage space lost when Davis removed the refrigerator wall that separated the kitchen from the dining room. 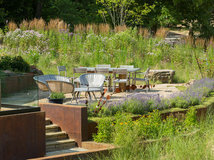 At the end of the island, Davis created a butcher-block breakfast table with seats for the couple’s two children. The material is bamboo. 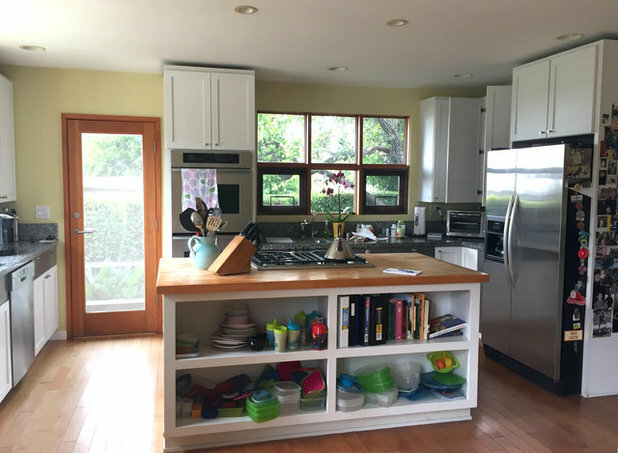 Davis reduced the bulk of the kitchen’s upper cabinetry by replacing the old vertically oriented cabinets with new horizontally oriented ones. 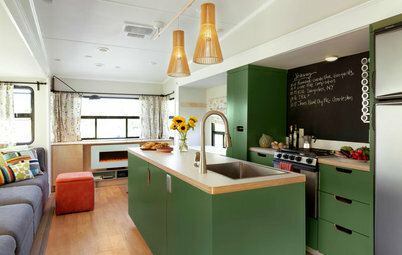 This helped give the kitchen “that open, airy midcentury modern feel that they wanted,” Davis says. Thanks to the storage Davis created on the pantry wall, decreasing the volume of upper cabinetry here balanced out just fine. 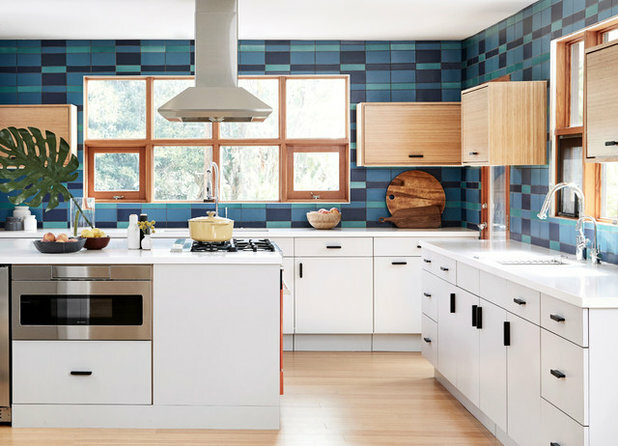 The homeowners love midcentury modern style, but although their home is from the midcentury period, it features architecture that isn’t modern. 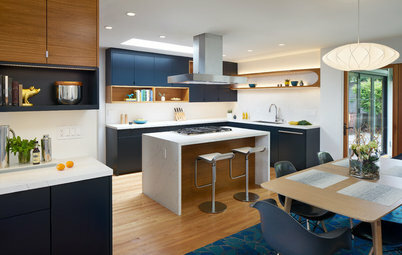 So Davis chose to reference the period rather than try to squeeze a midcentury modern kitchen into a space with architecture that didn’t align. To do this, she pulled colors from the period (grays, blues and oranges) and selected materials that echo finishes from that time. 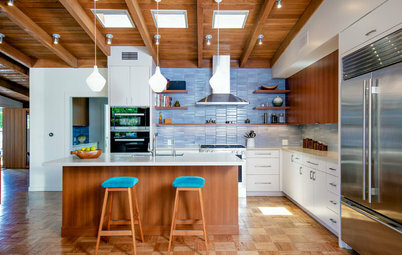 For example, walnut and teak were common in midcentury modern kitchens. 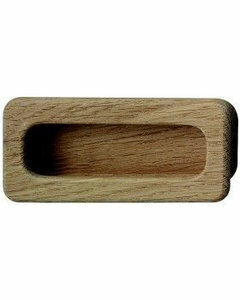 Here, lighter bamboo brings in the wood tones but adds a contemporary twist. Similarly, chrome was popular in the midcentury for faucets and other metal accents. 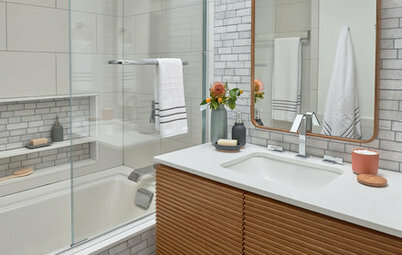 Davis chose chrome faucets but picked more contemporary oil-rubbed bronze for the cabinet pulls. The way the materials are used also references the midcentury period. 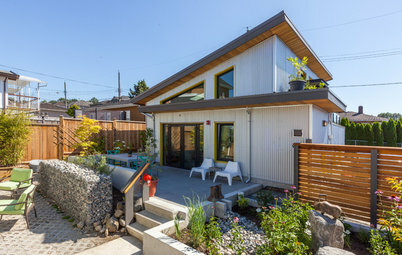 “Horizontal lines were common to the architecture of the period — horizontal planes over split-level homes — and clean, straight lines in furniture and materials. So we chose to run the [cabinet wood] grain horizontally to reflect that period,” Davis says. 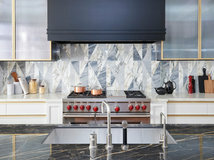 The kitchen counters are hardworking Caesarstone. 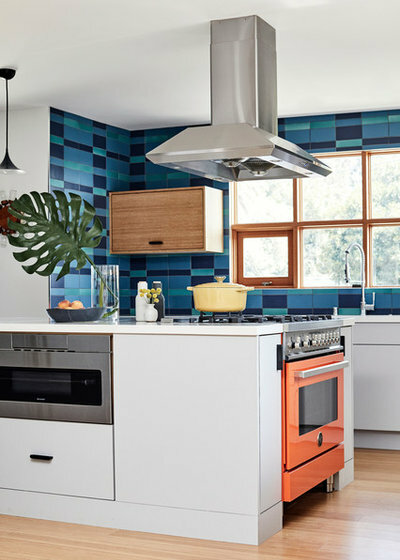 An orange Bertazzoni oven at the end of the island adds a pop of fun. 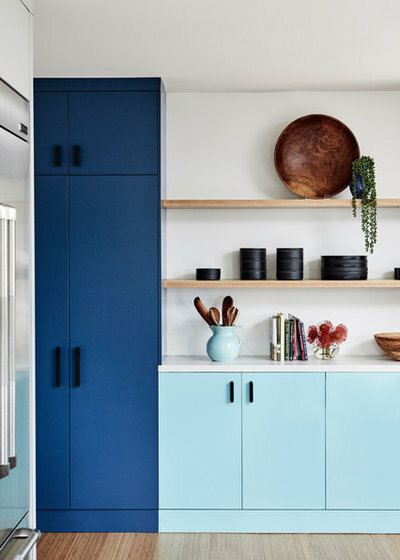 Tip: At their designer’s suggestion, the homeowners hired professional organizers to help them set up their cabinets and place all their items in their new space after the renovation was complete. 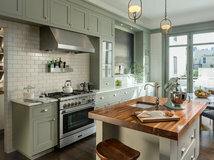 Although this kitchen was designed to fit the homeowners’ specific needs and lifestyle, by the end of any renovation it’s quite common for homeowners to feel some decision fatigue. That’s where professional organizers can really help out — by setting up a space and showing the homeowners how to maximize it. 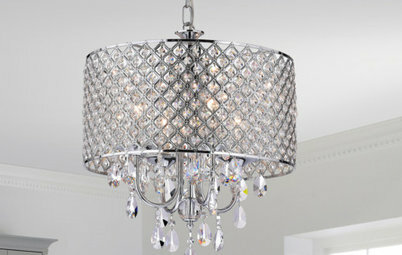 Davis often recommends that her clients hire a professional organizer to set up their newly renovated spaces. 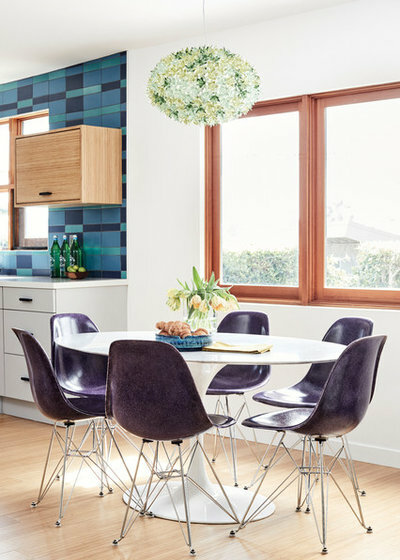 Love the purple chairs too and the Knoll light fixture... is that a vintage one or can it be purchased somewhere? Gorgeous! Super creative nod to MCM without adhering too rigidly.